Standing L-R: Rocco Andriola, Colleen Wenke, John McGinley, Anthony R. Davidson. Seated L-R: Chris Mills, Neil Madsen, Louis P. Mirando, Kiwesa King, Hugh Kelly. The Fordham Real Estate Institute (REI) is pleased to formally announce its Executive Advisory Council (EAC). 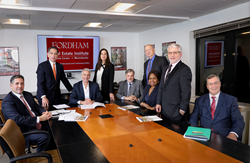 Twenty of real estate’s brightest minds have joined together with Fordham to aid in thought leadership, curriculum development, research, scholarly activities, recruitment, philanthropy, sponsorships and events. All EAC members are prominent industry leaders in local, national and international markets. Below are the 2018-2019 Fordham REI EAC members. For more information about the REI and the EAC, visit http://www.fordham.edu/realestate. Fordham Real Estate Institute (REI) currently offers a Master of Science in Real Estate (MSRE), a graduate certificate, and a comprehensive array of professional real estate certificates at its campuses in Manhattan and West Harrison, N.Y. Serving professionals and owners/investors of all stripes, the MSRE curriculum presents the essential elements of real estate finance, investment, development and management. The programs are developed and taught by leading industry practitioners and are centered on imparting real-world professional skill sets. Flexibility and convenience are program hallmarks as classes can be taken in-person, online, and at various paces. REI is a part of Fordham’s School of Professional and Continuing Studies. For more information, visit http://www.fordham.edu/realestate.